Edencroft – New Old Pulteney 17 YO – Perfect For Burns Night! Edencroft has a nice new Highland Old Pulteney 17 YO this week to add to their range. Perfect for Burns Night! Founded in 1826 by James Henderson at the height of Wicks celebrated herring boom, the Pulteney Distillery is one of the most northerly on the British mainland. At a time when road links to the town were yet to be established, the distillery was dependent on the sea for its supply of barley and for the shipping out of its malt whisky. Wick became known for the barrels of silver (herring) and gold (whisky) which left the port in vast numbers. The distillery itself has an absorbing history, with its unique stills defying convention to this day. The wash still, in particular, is a source of fascination to visitors due to the absence of a swan neck. Legend has it that when the still was delivered it was too tall for the still house and the manager simply decided to cut the top off! The Old Pulteney bottle now incorporates a bulbous neck to reflect the shape of the stills. Over time, the distillery has passed through the hands of various owners, and even closed during times of trouble for the industry in 1930. Luckily, the repeal of an often forgotten period of prohibition in 1947 saw the welcome resumption of whisky production, with the distillery changing ownership a number of times, before its purchase by Inver House Distillers in 1995. Throughout this history what has endured is the quality of the whisky. Traditional craftsmanship and the distillerys windswept location continue to contribute to the award-winning whisky that is Old Pulteney Single Malt Scotch Whisky. 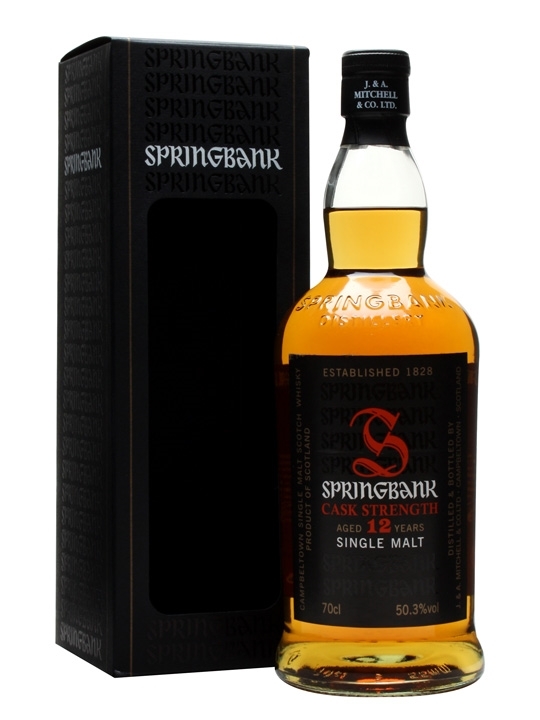 70cl / 50.3% / Distillery Bottling – The 7th batch of Springbank’s excellent 12 year old Cask Strength whisky. Well known for its sherry influence it’s the keystone of the regular Springbank range.